Groupe Country Rock US formé en 1969 à Los Angeles (Californie). 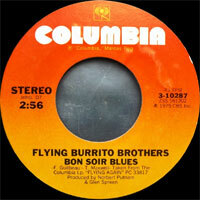 Le groupe portera le nom de "Flying Burrito Brothers" :1968-1972, "Burrito Brothers" : 1980-1985, "Flying Brothers" : 1985-1988. Membres originaux : Gram Parsons, Chris Hillman, Sneaky Pete Kleinow, Chris Ethridge, Jon Corneal et Popeye Phillips - Membres 1969 : Gram Parsons, Chris Hillman, Sneaky Pete Kleinow, Bernie Leadon et Michael Clark - Membres 1971 : Chris Hillman, Al Perkins, Rick Roberts, Joel Scott-Hill, Alan Munde, Byron Berline, Kenny Wertz et Roger Bush - Membres 1981 : Gib Gilbeau, Sneaky Pete Kleinow, Skip Battin, Greg Harris et Ed Ponder - Membres fin 1981: Gib Gilbeau et John Beland - Membres 1985-1988 : Sneaky Pete Kleinow, Skip Battin, Greg Harris et Jim Goodall. Depuis 2002, ils sont devenus les "Burrito Deluxe". The Flying Burrito Brothers helped forge the connection between rock and country, and with their 1969 debut album, The Gilded Palace of Sin, they virtually invented the blueprint for country-rock. Though the band's glory days were brief, they left behind a small body of work that proved vastly influential both in rock and country. The Flying Burrito Brothers reunited later in the '70s, albeit without their founding members Gram Parsons and Chris Hillman, and continued performing and recording in a variety of incarnations into the '80s. Originally, the Flying Burrito Brothers were a group of Los Angeles musicians who gathered together to jam. Gram Parsons and Chris Hillman took the band's name when they were forming their own band after leaving the Byrds. 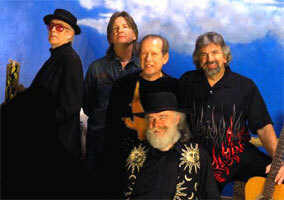 Parsons had helped steer the Byrds toward a country direction during his brief stint with the band, as captured on the 1968 album Sweetheart of the Rodeo. Following the release of Sweetheart, he left the Byrds, followed shortly afterward by Hillman. The duo added pedal steel guitarist Sneaky Pete Kleinow and bassist Chris Ethridge to the band and set about recording their debut album with a variety of session drummers. The Gilded Palace of Sin, the Flying Burrito Brothers' debut album, was released in the spring of 1969. Although the album only sold 40,000 copies, the band developed a devoted following, which happened to include many prominent musicians in Los Angeles, Bob Dylan, and the Rolling Stones. Around this time, Parsons and Stones guitarist Keith Richards became good friends, which led to Parsons losing interest in the Burritos. 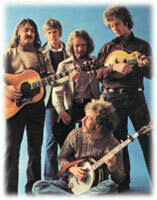 Before the band recorded their second album, Ethridge left the band and was replaced by Bernie Leadon, and the group hired ex-Byrd Michael Clarke as their permanent drummer. Burrito Deluxe, the group's second album, was released in the spring of 1970. After its release, Gram Parsons left the group and was replaced by Rick Roberts, a local Californian songwriter. Roberts' first album with the band, The Flying Burrito Brothers, was released in 1971. After its release, Kleinow left the band to become a session musician and Leadon departed to join the Eagles. 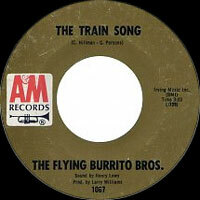 The Burritos hired pedal steel guitarist Al Perkins and bassist Roger Bush to replace them, as well as adding guitarist Kenny Wertz and fiddler Byron Berline to the lineup. This new version of the group recorded the live album The Last of the Red Hot Burritos, which was released in 1972. Before its release, the band splintered apart. Berline, Bush, and Wertz all left to form Country Gazette, while Hillman and Perkins joined Manassas. Roberts assembled a new band to tour Europe in 1973 and then dissolved the group, choosing to pursue a solo career. Roberts would later form Firefall with Michael Clarke. Close Up the Honky Tonks, a double-album Flying Burrito Brothers compilation, was released in 1974 because of the burgeoning interest in Gram Parsons. Capitalizing on the collection and the cult forming around Parsons, Kleinow and Ethridge formed a new version of the Flying Burrito Brothers in 1975. 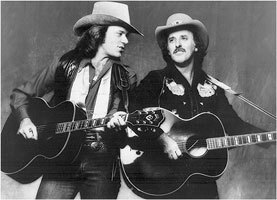 The duo recruited Floyd "Gib" Gilbeau (Vocalss, guitar, fiddle), bassist Joel Scott Hill, and drummer Gene Parsons and recorded Flying Again, which was released on Columbia Records in 1975. Ethridge left the band after the release of Flying Again; he was replaced by Skip Battin, who appeared on the 1976 album Airborne. Also in 1976, a collection of Gram Parsons-era outtakes entitled Sleepless Nights was released on A&M Records. For the two decades following their 1975 reunion, the Flying Burrito Brothers performed and recorded sporadically, undergoing the occasional lineup change. In 1979, the group released Live From Tokyo on Regency Records; the album spawned their first country hit, a cover of Merle Haggard's "White Line Fever," which hit the charts in 1980. 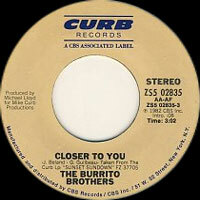 Also in 1980, the group abbreviated its name to the Burrito Brothers when they signed a contract with Curb Records. The Burrito Brothers' Hearts on the Line spawned three minor country chart hits in 1981. Sunset Sundown, the Brothers second Curb album, appeared in 1982 and like its predecessor, it produced three minor hits. Following the release of Sunset Sundown, Kleinow left the band to become an animator and special-effects creator in Hollywood. The group carried on without him, led by Gib Gilbeau and John Beland. That incarnation of the band fell apart in 1985, the same year that Kleinow assembled yet another version of the band. For the next three years, this incarnation of the Flying Burrito Brothers toured America and Europe. In 1988, the group split apart again, although it did occasionally reunite for further tours and recordings in the '90s, including 1999's Sons of the Golden West. 12/2002 CD LAMON 10299 (US) GEORGIA PEACH - BURRITO DELUXE - Wheels / Secret Of Life / Cash On The Barrel Head / Hickory Wind / Bluest Brown Eyes / She's Still The Queen / Street's Of Baltimore / Call It Love / Christine's Tune / Old Memories / She Once Lived Here / Louisiana / Feels Like A Heartache / G.P.